While the Staples and Ludlowe girls volleyball teams have been locked into the FCIAC playoffs for games, Wednesday's showdown between two of the three teams tied for first place served as a barometer with the postseason around the corner. And despite several impressive rallies by the Falcons, it was the Wreckers celebrating on its home court with top spot still in sight. As Staples walked off the court with a 3-0 (25-23, 25-23, 25-22) win over Ludlowe for its 11th straight win, a playoff mindset was well entrenched. "I thought we were great tonight," Staples coach Jon Shepro said. "I thought the passing, we covered the floor well. We've called it November because no ball hits the floor until the end of November. No ball was hitting the floor without a body next to it." Staples (16-1) looked as if it would cruise to an easy win in the first game, steadily building a 24-16 lead behind the powerful arm of Amelia Brackett. The Falcons, however, scored the next seven points to pull to within one. On the ensuing point, Ludlowe (15-2) was unable to get the ball over following a return and Staples claimed the set. 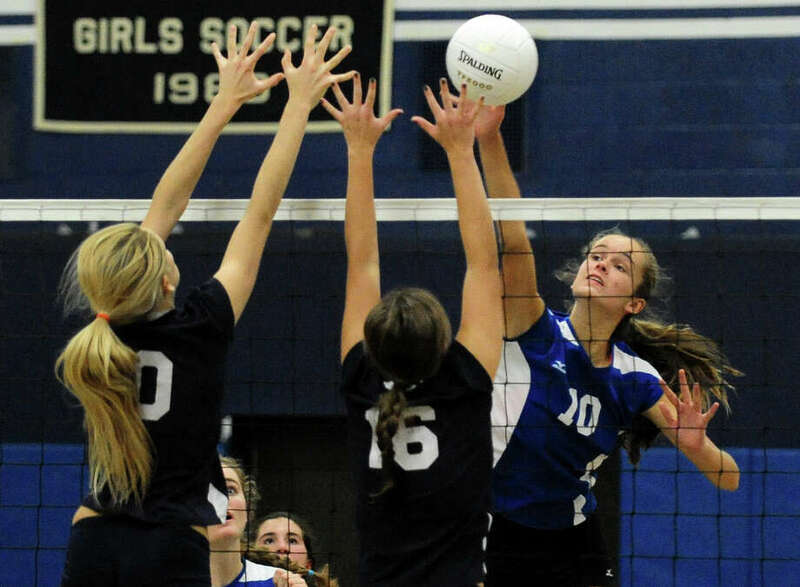 "Staples is a great team, we had highlights at times but we weren't consistent," Ludlowe coach Meghan Skelton said. "A little too late, we did have our rallying points in all three games but too late and too inconsistent." The Falcons burst out to an 8-3 lead in game two, but that was quickly erased and the teams began trading points. Staples inched ahead for good at 20-19, and Brackett delivered the decisive kill to claim the game. "Amelia was great as always," Staples senior Lauren Mushro said. "Getting her up front; everything with the blocks; it was awesome." Ludlowe had its biggest lead of the match in the third game, holding a 14-9 advantage. Staples then scored 13 of the next 16 points to hold a commanding 21-17 lead. With the score 24-22, Brackett and Knox Schieffelin combined on a block to seal the win. "We knew they had a really tall middle, we focused on our back row and getting every in the right spot," Mushro said. "We really kind of practiced to (Ludlowe's) game." With five or six quality teams with a realistic chance to win the conference, avoiding a tough quarterfinal opponent was high on the minds of the Wreckers. "We knew this was one of the biggest games for us," Mushro said. "We were excited. Depending on if you have a hard game first you could be out; its single elimination. This was important so we can get a high seed." Skelton had a very simple message for her team following the close defeat. "Let it be a learning lesson, this isn't FCIAC's or the state playoffs," she said. "This is ammunition; we can't play like this again."